So, you’ve seen Dunkirk and Baby Driver and now you’re looking for something a little different? Our new feature rounds up the best independent cinema, film festivals and unique cinematic events around the capital. Put the popcorn on, we've got you covered. August is (supposed to be) a summer month and brings with it a host of outdoor cinema events, where you can bask in the glory of a rare warm day on a deck chair and take in a classic movie. The Luna Touring Cinema spreads across the city's royal parks this month, offering classic romance perfect for date nights, including Four Weddings and a Funeral (August 3), Casablanca (August 4), Notting Hill (August 10) and Pretty Woman (August 24). The al fresco viewings don't stop there. Rooftop Film Club, on the roofs of Peckham's Bussey Building and the Queen of Hoxton, is hosting a range of classics across the month (you can't see True Romance too many times), and a few modern greats like Get Out and La La Land. In conjunction with their ace Science Fiction exhibition (check out our write-up here, then head over before it ends in September), the Barbican are putting on some outdoor sci-fi in their sculpture court, including 2001: A Space Odyssey (August 25), Tron (August 26) and Alfonso Cuarón's technical tour-de-force Gravity (August 27). If seeing a film outdoors still isn't wild enough for you, try it floating down the Thames with Movies on the River – you can see Moonlight on a massive screen while taking in the (sometimes) fresh river air on August 12. 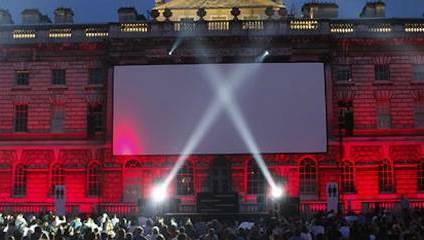 Somerset House's outdoor Summer Screen season is always one of the best film events of the year, and 2017 is no different, with the impressive coup of screening An Inconvenient Sequel: Truth To Power: the follow-up to Al Gore's seminal documentary about climate change. Gore will be there in person for a Q&A on August 10. They're also showing the likes of Victoria (August 11), Donnie Darko (August 12) and Cruel Intentions (August 21) across the month. Meanwhile over at the Natural History Museum there's a family-friendly run of films that you can watch while sitting under the skeleton of a blue whale. Pick from the suitably aquatic Jaws (August 12), Free Willy (August 13), Finding Nemo (August 14) or The Little Mermaid (August 15). Before each screening a scientist will explain some of the facts and myths behind the creatures in each movie, so you can learn a little something too. No cinematic round-up would be complete without that venerable home of cinema, the BFI. The Southbank staple has an impressive spread of films throughout the month, including a 60s Drag Double-Bill on August 4, where two documentaries explore London's drag scene in the hippie era. A party in the Blue Room, hosted by East London's queer hotspot The Glory, follows the event. Later in the month they're back to the 60s, with An Impossible Cinema: Cuban Documentary in the 1960s: an exploration of radical Cuban documentaries on August 23. The next day sees another special event: a screening of the BBC's Edward II, filmed in 1970, which featured British TV's first gay kiss. Star Sir Ian McKellen will be on hand for a Q&A afterwards. We're between seasons for London's major film festivals, but there are a couple of smaller fests more than deserving of your time. London Feminist Film Festival takes place at the Rio Cinema in Dalston from August 17 – 20, where the films range from feminists under the Nazis, to cycling in Uganda and an exploration of honour killings. Their top film is the excellent 1977 Iranian movie The Sealed Soil, about a woman struggling for independence in a southern Iranian village. Despite winning awards, it's never been shown in Iran. For something a little lighter, Guildhall Yard is running an outdoor Swords and Sandals festival for films inspired by Rome, with picks including Monty Pyhton's Life of Brian (August 7), Roman Holiday (August 9), and of course, Gladiator (August 15). Where would be without the city's amazing independent cinemas? Between the Prince Charles, Whitechapel's Genesis, Close-Up in Shoreditch and Deptford Cinema, there's more to pick from than could ever fit on a list – but here are some highlights. The Prince Charles Cinema in Leicester Square is showing Lars Von Trier's underrated gem Dancer In The Dark (August 9), starring Björk, and John Cassavetes' wrenching masterpiece Love Streams (August 15). Meanwhile the Cinema Museum are doing a season on controversial filmmaker Ken Russell, including a screening of his banned-on-release whirlwind The Devils on August 24 introduced by respected critic Mark Kermode. We can't miss out on our personal favourite film series either – East London's labour of love Deeper Into Movies, which is showing Wong Kar-Wai's brilliant romance In The Mood For Love (August 8) and Bernado Bertolucci's erotically bohemian The Dreamers (August 14). A final tip for movie fans that also dig theatre – the National Theatre's productions of Angels In America and the Young Vic's Yerma practically sold out instantly, but you can catch National Theatre Live screenings of both at The Barbican at the end of August. We're hoping everyone emerges from August blinking his or her rectangular eyes. As was once written on the board above The Prince Charles Cinema – sod the sunshine, come sit in the dark.